Yarn Dominance may sound a bit aggressive and overly pushy, but get to know it and you'll think there's nothing sweeter. I first heard about yarn dominance from Beth Brown-Reinsel at a workshop I attended last November. This tid-bit -- along with the life changing skill of learning to knit with 2 colors in the same hand -- made the workshop worth its weight in gold. 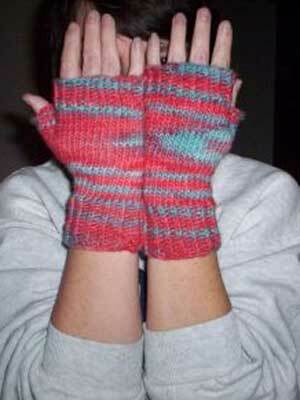 In this example the same pattern was knit twice. In the bottom half the orange is dominant over the purple, while in the top half the purple is dominant. The effect is subtle, but especially noticeable in the checkerboard center of each motif -- can you see it? Doesn't the motif in the bottom half look crisper than that in the top half? So, how do you control which yarn is dominant? When knitting with two yarns one of the yarns will sit below the other -- coming from underneath. It is this yarn -- picked up from under the other -- that is the dominant yarn. 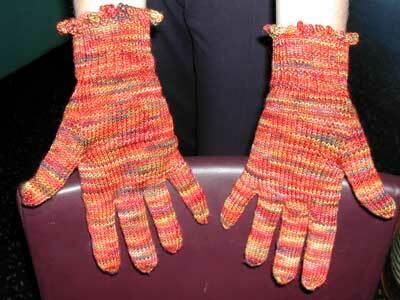 For example, when I knit with two colors I hold both colors in my right hand. On the the knit side, the yarn held farther away from the knitting needle will come from underneath and is the dominant yarn. While on the purl side, the yarn held closer to the knitting needles comes from underneath and is dominant. Why not experiment a bit and see if you can control yarn dominance. It's these little details that elevate the craftsmanship of a knit item. Take one of Beth Brown-Reinsel's fabulous workshops! ps are you ready for some jack bauer dominance? I like the term "yarn dominance." 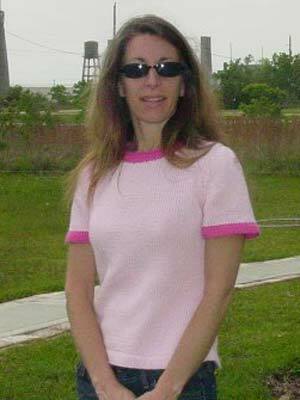 I'm a two-handed color knitter and the yarn in my left hand is always held lower, therefore prominent. 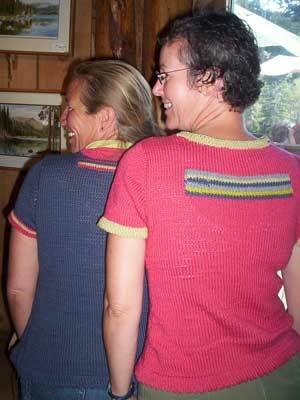 Oddly enough in Latvian Dreams, Joyce Williams says that isn't always the case (i.e., yarns from the left hand being prominent) with two-handed color knitters. I'm not sure why though. Thanks so much for this info!! 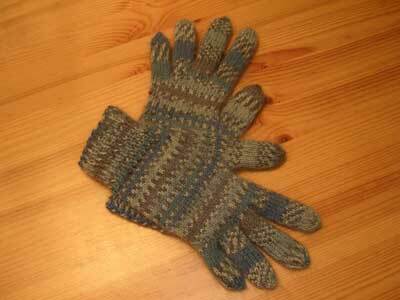 I'm dreaming about a pair of Swedish mittens as my next project and this is something I'm going to try. Thanks for sharing!! 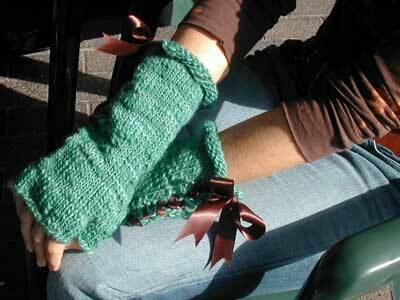 Hmm, very interesting...I'll have to experiment with this as I actually hold both yarns in my left hand. This is so interesting. I thinking of yarns for a 2 color project and had landed on the yarn dominance issue without knowing it had a name. Or why it happened. Thanks! ... and to think I was finally ready to try 2-color knitting! This sounds much too deep for my early morning brain to comprehend. 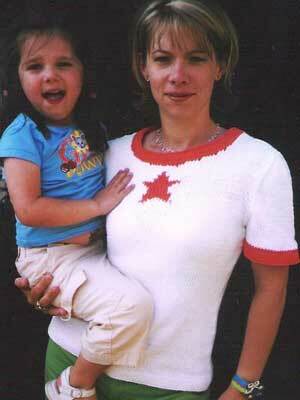 Nona -- We've been re-watching last season's "24" on DVD -- only six more days til JACK IS BACK! Wow, how perfect your post. I just saw an episode of Knitty Gritty that had fair isle as the subject and it really got me wanting to do some. Thanks for this. Can't wait to try it. And what happens when you consistently twist your yarns? Actually, I know the answer to this since that's how I usually do 2-color knitting. I haven't done a lot of fair isle, mainly just borders and bands, but your bag is sure tempting my little knitterly heart! Oh, Nona, I love these informative posts of yours. Mary Heather gave me that wonderful Ann Feitelson book as a going away present when I left California and I read that thing cover to cover in a weekend. It's a classic, isn't it? I've been meaning to do a book review, especially since I think it's one of those books that gets sadly passed over. Thanks so much for this reminder on yarn dominance. I'm really looking forward to my class with Beth Brown-Reisel! Very interesting! I'm going to have to look into this further. Another informative and thought-provoking post from nona - thanks! Thanks for the tips Nona!! I haven't done much 2-color knitting so far, but the next time I do i will put this into practice. ever informative. Thanks nona. explained well. I'll give it a try. The top and bottom half look the same to me. Thank you! 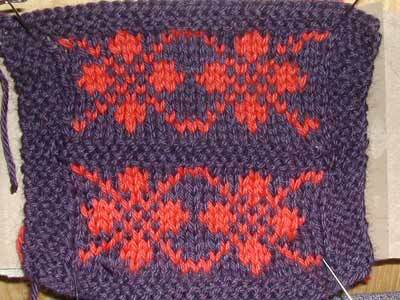 I caught up with this a few days ago, a couple of inches into my first fair isle project. I should have frogged and re-knit those inches, as my yarns were just the opposite of what I wished, but at least I was able to re-tool for the rest of the hat. 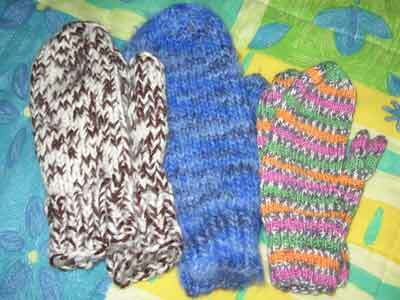 (I had already frogged and re-knit same inches once for tension challenges. I don't believe the hat recipient (husband) has a subtle enough eye to see the difference, but I can. However, it's my first fair isle and I'm willing to regard it as a learning experience.) Why didn't Montse Stanley warn me about this while I was studying "Knitter's Handbook" for options for two-color yarn holds? 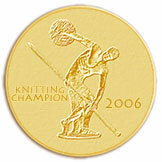 I never would have come so far with knitting in the past year if not for knitbloggers. Hurray for the information age! Okay, this is SO helpful. I couldn't figure out why one of the colors on the mittens I just finished was receding into the yarny abyss. As usual, thanks for the great technique info! Thank you for posting this! I took one of Beth Brown-Reinsel's classes where I learned this (in fact that was the first time I'd ever heard of the concept) but couldn't for the life of me remember which was the dominant color. This is the first time I have seen this...as I am finishing my first pair of fancy fair isle mittens...and now I have to decide if I want to go back andr eknit them because this does make such a difference! Honestly I think I am going to err on the side of just knitting a different pair later...but I am so glad to know for the future. get what ever colors you want just remember that you will have those colors for a whole month. when there was a holiday in a month i would get colors that went with the holiday. christmas i would get red and green, 4th of july red, white and blue. so on and so forth. but it is really up to you. I loved this post. I really like the ideas they provide and as the subject development. thank you very much! Very nice example you provided I agree with author what "Yarn Dominance" sounds aggressive. In the bottom half the orange is dominant over the purple, while in the top half the purple is dominant. The effect is subtle, but especially noticeable in the checkerboard center of each motif -- can you see it?